Mike UYllery | Daily Call A man was taken to UVMC to be checked out following a one-care crash on Co. Rd. 25-A at Peterson Road on Monday morning. The man reportedly suffered a medical condition before impacting the guardrail. A truck driver who was following the vehicle said that the driver appeared to suffer a seizure. He stopped and assisted the driver until Piqua Fire Department EMS arrived on the scene. A man was taken to UVMC to be checked out following a one-care crash on Co. Rd. 25-A at Peterson Road on Monday morning. The man reportedly suffered a medical condition before impacting the guardrail. A truck driver who was following the vehicle said that the driver appeared to suffer a seizure. He stopped and assisted the driver until Piqua Fire Department EMS arrived on the scene. 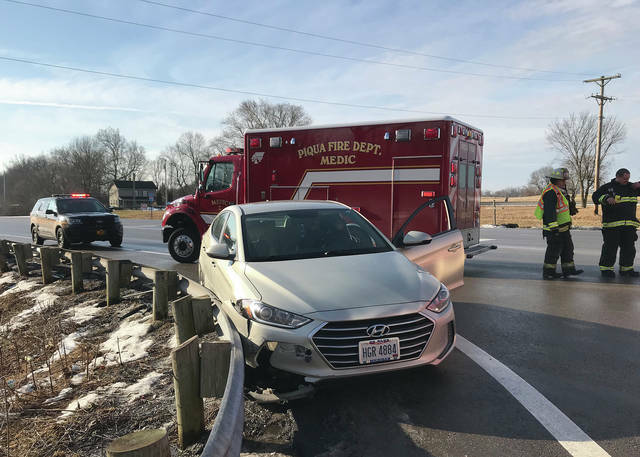 https://www.dailycall.com/wp-content/uploads/sites/30/2019/02/web1_020419mju_crash_25a.jpgMike UYllery | Daily Call A man was taken to UVMC to be checked out following a one-care crash on Co. Rd. 25-A at Peterson Road on Monday morning. The man reportedly suffered a medical condition before impacting the guardrail. A truck driver who was following the vehicle said that the driver appeared to suffer a seizure. He stopped and assisted the driver until Piqua Fire Department EMS arrived on the scene.